I found TG thanks to our very own Ellen!! She used to teach at a different Bay Area studio where I started out, but the moment I found out she was re- locating to TG, there was no question that I would follow, and it’s been the most positive experience everrrr!!! I’ve been a Twirly Girl for about 1 yr and 4 months! 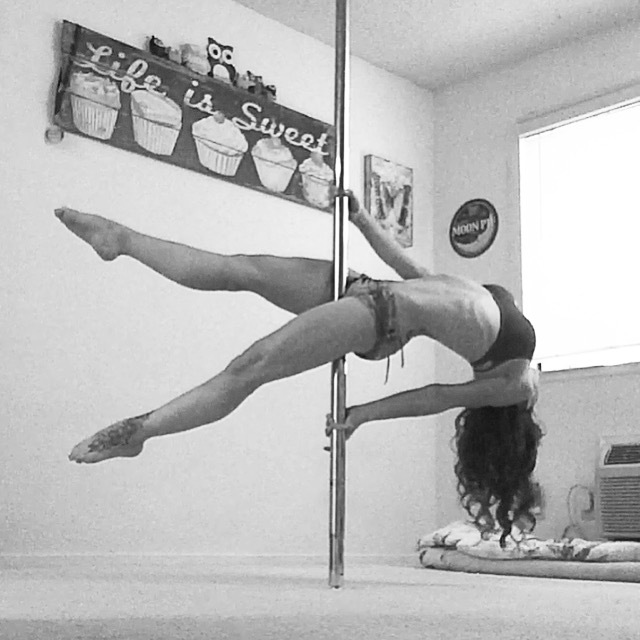 I take Ellen’s Pole Flow on Saturday mornings, and occasionally her Monday morning Pole Flow class. She teaches the perfect balance of dance/flow/spin along with multi-level tricks. I was most excited to get my cartwheel mount cuz it brings me back to my gymnastic days. Have you taken any workshops? I have not taken many workshops at TG, but am signed up for two of Crystal’s workshop later this month! Really excited for those!! I prefer to pole barefoot but I love the look of heels, and they are just so fun! They really change the lines of certain moves, which I like, plus to have longer legs if just for a moment makes me happy! W hat is your favorite song to dance to (at this moment)? The only songs I’m currently dancing/listening to are my NCPP songs, as in obsessively on the drive to/from work and about an hour each night, lol. For those of you who don’t yet know, I’d prefer to keep it a secret till the big day! Hm, just one guilty pleasure? Guess I’d have to say the “guiltiest” of them all is fried food like donuts and funnel cake. Oh and fried chicken, fries, you name it. Also, having Amazon Prime is pretty high up on the list too. Previous postUpcoming Workshops! Don’t Miss Out!